After having seen the basement, first and second floors – see our post HERE – we returned last night to the AGO see the upper galleries. We took the elevator up to the fifth floor, where the soaring ceilings made the rooms feel spacious. The only criticism we had, really was the inescapable feeling that the galleries were overcrowded. A lot of large scale work demands large open space to make it feel proportionate, like Brian Jungen’s oversized totem poles, or the Mark Lewis (next year’s representative at the Venice Biennale) excellent video of Algonquin Park. 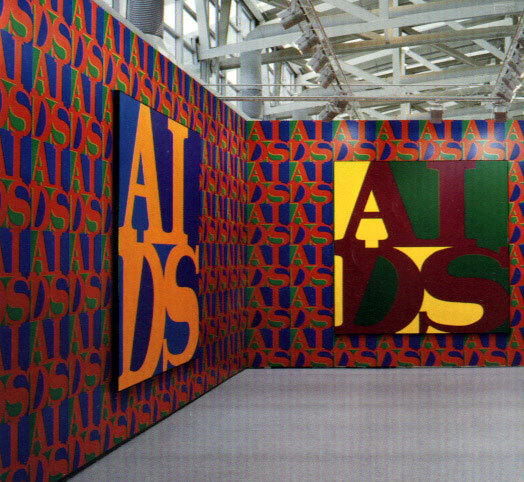 We loved Doh Ho Suh’s translucent fabric room, but couldn’t figure out why a fantastic – and enormous – painting by (VoCA fave) Attila Richard Lukacs was jammed in next to a cute little room devoted to General Idea’s Robert Indiana-inspired AIDS works. The large galleries are broken up with smaller spaces given over to individual artists – like Michael Snow and Betty Goodwin. In the centre of Goodwin’s room the curators installed a tiny, Alaskan ivory figure from 300 bc, which was a nice touch. There’s another small room devoted to excellent Richters that – we hear – the AGO purchased prudently in the late 70s or early 80s when they were still affordable, on the advice of Roald Nasgaard. We took the breathtaking glass staircase that goes from the fifth to the fourth floors, giving a nice view of Will Alsop’s OCAD building and the Grange park. The fourth floor was better, looser and more airy. There, we finally found the Warhol Elvises that we remember from our childhood visits to the AGO. The Claes Oldenburg hamburger was nowhere to be seen, however. All in all, the new and vastly improved AGO is a gallery that Torontonians can be proud of. An eclectic mix of new and old jammed in with curatorial awkwardness, but those are fussy criticisms. It’s a gallery that will engage audiences! The best thing about our experience of the AGO happened after we left. In the taxi going home, our driver asked us how it was. Apparently, the AGO has given coupons to Toronto’s cab drivers, allowing them to spend a day free of charge in the new building. Our cabbie was really looking forward to it and peppered us with questions. As we sped up University Avenue, we passed the ROM’s crystal and he wondered what that was like. I agree it did feel chock full, but I have to say I love it. Had a similar experience with a security guard who could not stop talking about how much he loved Mona Hatoum!